Live has been wonderfully full of family the last few days. I am so tired. They all went to bed early. A wonderful day for our family. Steve’s mom and I took the boys to UCSF, my friend Debbie M picked up Paco and took him with her family to the Science Museum. Judy watched Lemon for me while I got an Avastin treatment and bonded with another Giant Cell tumor woman. She is exceptional and I will be calling on her on days when life seems more negative than positive. We left Steve with his dad for a late celebration of Steve’s 41st. I invited all the guys I could remember to (I forgot a few) and 6 smart, kind men sat around and watched car movies. I owe one to all their spouses, all of whom were looking after the kids, I am sure. I had to ban kids, which seemed mean, but Steve never gets a day of peace anymore. Tomorrow, I am off duty all day. I will sleep. Judy has the monitor. Lemon is a ham. That is for sure. Paco is smoldering, Lemon is wicked. He is not quite 15 months and already manipulative. I like to call that intelligent. So, no hives, a wonderful Avastin Day and lot so help from Mom, Clark, Judy, Mike and Debbie M.
Mom can write about the wonderful evening. I don’t have hives! The Pediatrician who called Thursday said to look out for the call from Podiatry, they called Friday and said, get the cast! Mom met me at Morse Friday, then came today and folded about 15 loads of laundry AND watched Lemon the entire time. Paco watched TV in our room. I tried to run this afternoon, but without some body pushing me, I am not there yet. But still, I walked. Better than nothing. Then mom stayed with a sleeping Lemon and Paco and I went to pick up Abuelos de Michigan. They are here on a working vacation. They are going to be sooooo tired. Grandparents must want to live about an hour or 2 away. Just to be on duty once a month and not have to fold laundry every week. My mom, the folder-at-large. Lemon adores her. Platelets are 271. (I think, will double check tomorrow). Not bad. Paco’s pediatrician called Erin on Thursday and said that the radiologist had read Paco’s x-ray, and there was indeed a hairline fracture of his right pinky toe. 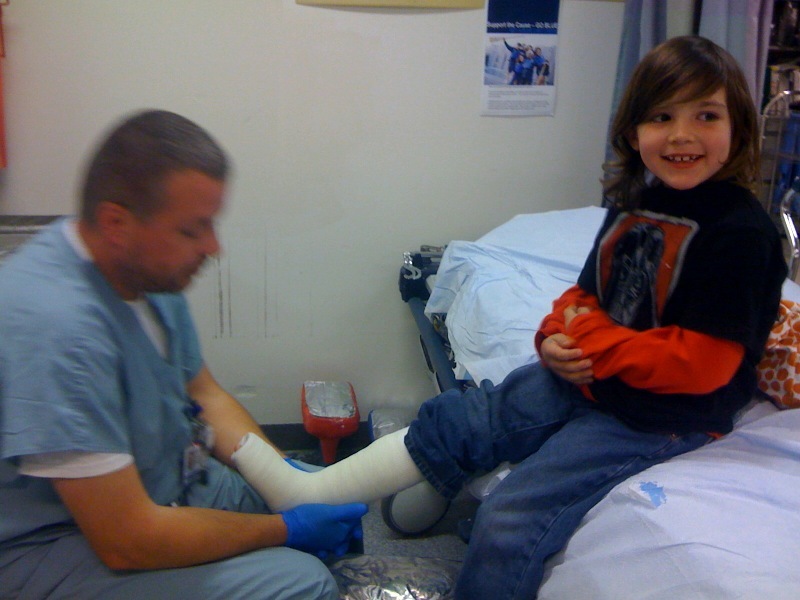 The pediatrician thought that the best way to keep the toe immobile was to have a cast. So, Erin had to bring Paco to Kaiser on Morse Ave in Sacramento for the foot to be cast. Paco fell on the garage steps. Erin mentioned that it was Steve’s birthday yesterday. 11 years ago when we were celebrating Steve’s 30th at Bodega Bay, I fell on some steps and broke a toe. Steve, what is it about your birthday and broken toes? What a trooper. The person putting on the cast is named Tim. Today is Steve’s birthday.Tim’s is the same as mine! Paco is a bit nervous. Insisted I find a cousin. Found a Beck, and then he fell asleep in the car. He stayed asleep until Lemon was in his high chair. I had gone through the in & out drive thru (at his request) during the nap. I woke up this morning, Day 5 of temodar sent me to a unhappy, frustrated place. But then phone call of kind person, emails helped (two grandmas, two nurses and a doctor). And after I took the Temodar early, I had the great gifts of Beckett and Brandon here. Then I scooped up Paco and took him to Morse to get a cast on his foot. Emotion is ramped up on steroids. Because of the Temodar, I am on steroids. They do not bring out the best in me. Today, I was so cranky. And I met Amanda for lunch. The whole world pulled joy out of Lemon. He blew kisses to all. He has so many to share. I love my good friend Amanda. She is moving soon. And it finally came to reality today.This was likely our last girl’s lunch for months. And instead of appreciating what we had, a timeless friendship, I actually became quite sad. We have been long distance friends for over a decade, yet the last few years, only an hour apart. I will miss her so. She was there when Lemon arrived. Today, she held him most of the time. And he tried to eat her hand. I needed a reality check from Steve, “this is normal right, this is not about cancer.” He sweetly laughed, held me and said, “This is normal.” Amanda was indeed his friend first. After lunch, both Amanda and I had to rush off to collect our older children. In opposite directions we headed, of course. I collected my Pacquito and headed off to get his foot checked out. He decided he wanted to see the doctor. His Pediatrician is a lovely man, and worries about me a fair amount. The Pediatrician decided to x-ray the foot just in case. So I called the great Babs to rush to me so I could go in with Paco while she stayed with Lemon. As I was changing Lemon’s diaper, the x-ray group was running ahead and took Paco minutes early. Paco went in so fast, I did not even realize. Paco went and did it, all on his own. I know it seems like a small, painless thing, yet it was a first. I love Kaiser. His appt was at 4:15, by 5:45 the pediatrician looked at it, (clear and healthy) and Mom and Clark arrived. So of course, Clark insisted on taking us to dinner. And it was just fun and relaxing. Paco enjoyed the company so much. I cannot believe Paco. A year ago he was afraid of the world. Now he seems ready to take it on.